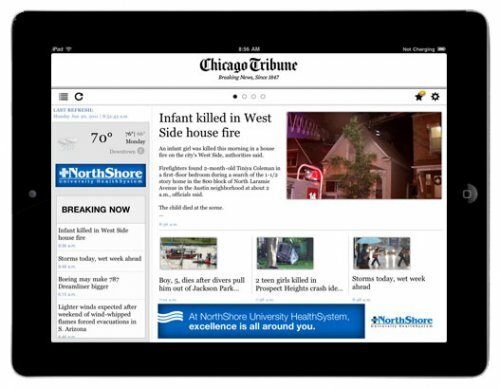 Due to the succes of the Apple’s tablet, The Tribune Co., one of the largest newspaper publishing companies, is developing a touchscreen tablet of its own. The device will run a modified version of Google’s Android and will be offered for free, or at a low cost to people who agree to sign up for extended subscriptions to one of its major papers: Chicago Tribune, the Los Angeles Times, the Baltimore Sun, the Orlando Sentinel. It is possible to have also a wireless-data plan with a partner cellular carrier. Tribune already started discussions with hardware makers, including Samasung, regarding the manufacturing of the device. The project is not at the beginning, due the fact that it was originally hoped that testing could begin this month. The future of the project is uncertain because, the company is immersed in a financial crisis and is currently hammering out bankruptcy-induced restructuring. The tablet project could turn things around, but at the moment Tribune has said nothing about it.